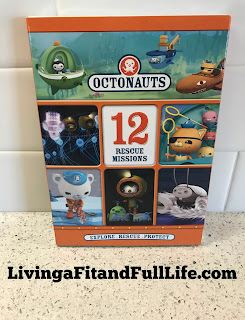 Living a Fit and Full Life: Go on an Adventure with Octonauts: 12 Rescue Missions from NCircle + Giveaway! Go on an Adventure with Octonauts: 12 Rescue Missions from NCircle + Giveaway! Mariana Trench Adventure Tweak has designed a brand-new Deep Sea Station to study the deepest, darkest reaches of the ocean, but the Octonauts face multiple challenges: from getting it down there, to the extreme environment and strange, prehistoric creatures that greet them once they arrive. Barracudas Shellington and the Vegimals mission to replant a mangrove forest is put in peril by a school of toothy barracudas. Artificial Reef When an underwater storm destroys a small reef, which a frogfish and other creatures depend on, Tweak and her crewmates must convert the Gup-F into an artificial reef before another storm strikes! Siphonophore Kwazii and Dashi become entangled in a strange deep-sea creature a siphonophore and when a geyser blasts it toward the surface, the Octonauts must stop its ascent before it bursts. Urchin Invasion The Octonauts head to the kelp forest to visit Shellington s sister, Pearl, and her newborn son, Periwinkle, only to find the forest endangered by an infestation of kelp-eating urchins! Lion's Mane Jellyfish A lionsmane jellyfish gets its long and stingy tentacles tangled in the bubble engine, unintentionally flooding the Octopod and causing havoc. Pelicans When a floating garbage patch endangers a flock of pelicans and other sea creatures, the Octonauts and the birds work together to clean it up. Red Rock Crabs When Shellington and the crew try to gather some skittish crabs who have drifted away from home, they get help from some old friends. Loggerhead Sea Turtle When an underwater tremor separates the Gup-X and its crew, Barnacles seeks guidance from a mysterious sea turtle. Harbor Seal When Peso s patient, a remora fish, mysteriously disappears, the Octonauts enlist a unique undersea detective: a harbor seal. Yeti Crab As Tweak tests the Gup-X deep down in the Midnight Zone, a yeti crab damages the ship, endangering itself and the Octonauts. Over Under Adventures The Octonauts mission to explore Antarctica becomes a desperate rescue as a group of sea stars and urchins are threatened by a brinicle a rare underwater icicle that can freeze creatures on the sea bed. Octonauts: 12 Rescue Missions from NCircle is a super fun DVD for kids! My kids absolutely love Octonauts so I knew they'd love this DVD. I have a 9, 7, 4 and 2 year old and this DVD kept all four of their attention better than just about any other DVD we own. My kids love that Octonauts: 12 Rescue Missions from NCircle is filled with action and adventure and let's not forget those cute little Octonauts. As a homeschooling mom of 4 I love that each episode is educational. My kids have learned a ton just from this DVD alone. 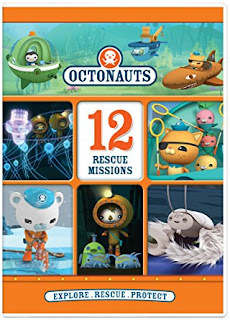 Octonauts: 12 Rescue Missions from NCircle is a great DVD for kids that will keep them entertained this summer!